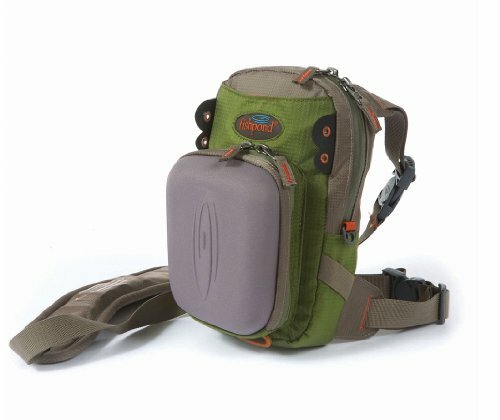 What Makes a Great Chest Pack for Fly Fishing? Have you ever been out on the water and fumbled to find a piece of gear in your unorganized backpack or fly fishing vest? There’s little more frustrating than lacking access to your important items in a time of need. Fly fishing vests are a popular choice for many anglers because they eliminate some of the unnecessary scramble to dig for gear. With all your gear available at chest-level, fly fishing becomes a little smoother. 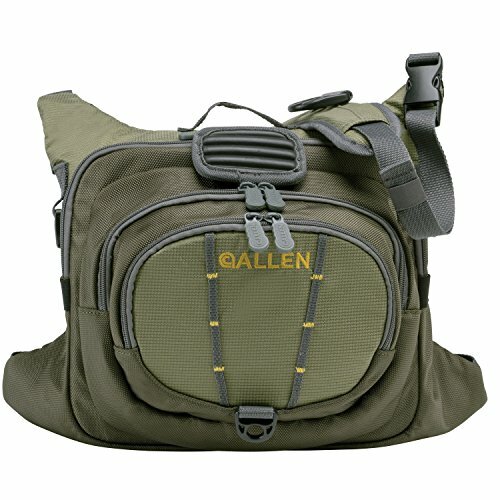 Chest packs are just one of many storage options anglers use for fly fishing. For that reason, it’s important to lay out the pros and cons of using a chest pack over a backpack or vest. 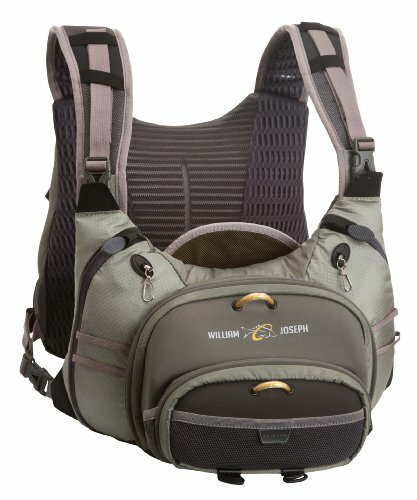 They Don’t Limit Movement: Chest packs are usually a popular choice as they tend not to limit movement as much as traditional fly fishing vests. There’s no need to worry about your items falling out when you bend or reach. Also, their lightweight design makes them quite comfortable to wear for extended amounts of time. Variation: Chest packs come in all different shapes and sizes. They’re not limited to a popular design, so anglers can pick and choose what feels right for their body. Some are small enough to only hold a fly box and small accessories, while others can hold tons of gear, a lunch, and a jacket. Keeps Gear Out of Water: Because of their placement on the body, chest packs do a really good job of keeping supplies out of the way of water. Size Can Limit Storage: Because they are so lightweight and meant to be carried on the chest, chest packs can’t accommodate the same amount of gear that a larger storage system can. They are limited to the essentials of fly fishing, which is better for anglers who go on day trips rather than those who regularly go on multiple day excursions. Front-Heavy: There are some fly fishing chest packs that have a little too much bulk in the front and can make it hard to see your toes. The majority of packs don’t have this problem, but some larger models can get in the way. While looking for a new chest pack, it's easy to feel overwhelmed by the many options. However, if you keep these features in mind while browsing models, you will definitely come out with a top pick. Let's see what make a great chest pack for fly fishing. In general, the smaller you can go with your chest pack, the better. The more lightweight and compact it is, the more functional it can be without getting in the way. It’s easy to be attracted to a bigger pack that claims it can hold more gear, but great small chest packs can hold almost as much, without the extra bulk. Plus, you’ll probably be using your pack for day trips, so you don’t need to bring your entire gear supply along with you anyway. With chest packs, the organization is key. Because you’re trying to put quite a few items into a small amount of space, a chest pack with a bad organization system can get messy very quickly. As a rule of thumb, having multiple pockets with varied storage space is the way to go. That way, you can separate the essentials from the non-essentials and keep them most handy. A great feature that many chest packs have these days is a fold-down work station. Try your best to find a pack that includes this, as it provides an extra layer of convenience. It’s much easier to rig up when you have a place to set things down. As always, you should consider the quality of your potential purchase. It’s always better to splurge for a higher-quality product that will last longer than go for a cheap product that is likely to fall apart. There are many great quality chest packs that come at a reasonable price. There are many companies that make great chest packs. If you’re feeling intimidated by the multitude of options that surround you, check out this list! We’ve compiled of our absolute faves that earn high marks in terms of value, quality, and style. While it may look small, the Fishpond Medicine Bow chest pack is mighty. It has several desirable features, including a large main compartment and several other storage spots, packed into a compact, lightweight structure. Fishpond values sustainability in more ways than one. All of their products, including this pack, are created with their recycled material Cyclepond. Cyclepond is made with repurposed abandoned fishing nets that have been pulled from oceans. In addition, the Medicine Bow pack features YKK aquaguard zippers for added water-resistance and strength. The main storage compartment of this pack is large enough to accommodate a sizeable tackle box and other small gear items, if necessary. It also has a fold-down space in front that acts as a fly bench; it can also zip up and down and is signature-molded. The foam is replaceable. This pack fastens over the shoulders but provides extra support through a waistband. Using the waist fastener can relieve some of the pressure from your back and neck throughout a long day on the water. Fishpond’s Medicine Bow pack is an awesome choice for those who are looking for a product that is sustainable and functional. This company is dedicated to bettering the spaces we fish through creating products that are recycled, which is a bonus that really can’t be beaten. This pack also achieves the complicated task of being large enough to carry a good amount of gear while being lightweight. Highly recommended. 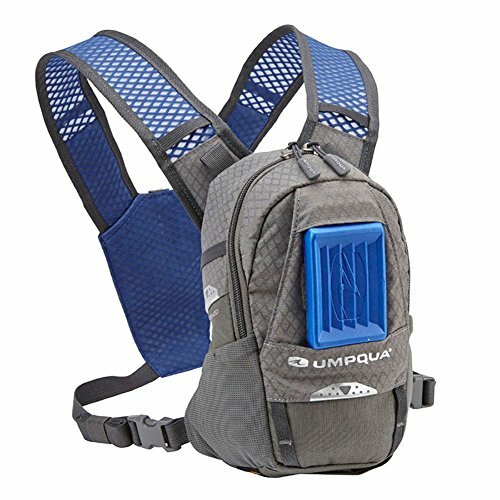 Over all else, Umpqua tried to achieve maximum comfort with the release of the Rock Creek ZS chest pack. With a fairly simple design, this pack was created with basic, no-frills functionality and comfort in mind. The Rock Creek pack features a design with a four-point back panel that connects over both shoulders and on the sides. This is quite different from a more traditional loop neck strap and is meant to keep the pack from digging into the angler’s neck and back. The main compartment is large enough to handle two large fly boxes, it also has two side mesh pockets that can stretch to accommodate any additional accessories you may have. In addition, it also comes with a foam fly patch station that can attach to the front of the pack for easy access. 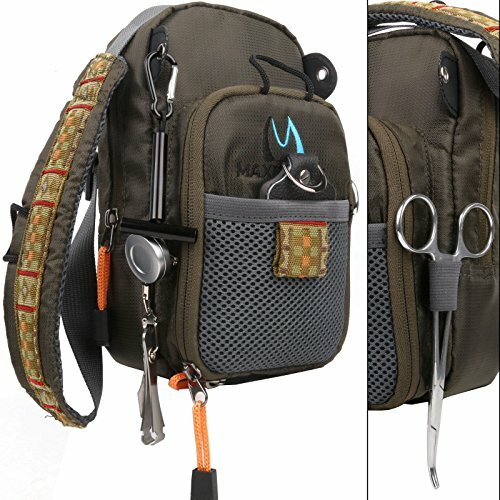 Other added features include a cord tippet holder, two front overlay pockets, and an internal key clip. Umpqua kept it simple with the Rock Creek ZS chest pack, and luckily, this no-frills approach works well. Rather than including a bunch of unnecessary bells and whistles, this pack makes functionality and comfort its first priority. Users do complain that it's a little smaller in person than it looks in photos, but it still carries quite a bit of gear for its size, so this isn’t a major deal breaker. The other downside of this pack is the lack of waterproofing, so make sure that you seal your phone/other electronics you may carry with you in a waterproof bag before putting them into this pack. This chest pack is another tiny powerhouse, measuring in at 8.5” x 4.8”, about the size of an iPad mini. But don’t be fooled by the seemingly too-small size; this pack can hold all of your essential gear. The chest pack is created with durable, tear-resistant ripstop nylon. The main pocket is sizable enough to fit a large tackle box and also features a mesh pocket to keep your essential small accessories within reach. Like many other chest packs, this one also features a zip-down fly bench on the front with removable foam. There are several loops and tabs included on the outside design that the angler can use for additional attachments. The sizing of this chest pack makes it super lightweight on one’s body. Design-wise, it features adjustable neck and waist straps to get the fit just right. The neck strap also features an ergonomic foam pad, which is meant to be more breathable and relieve some pressure from the weight of the pack. This is a great little pack, especially if you’re looking for something that is super lightweight and small, but functional. It has the space to accommodate your essential gear, and it’s made with high-quality, durable materials that won’t fail after one or two uses. The main complaint from users comes from the quality of the zippers, which tend to stick a little bit. But for this value, it’s easy to overlook. The Boulder Creek chest pack from Allen features a different shape than the other chest packs on this list thus far. It’s more rectangular and wide and features three large pockets rather than one or two. The first pocket contains a zip-down work station with a tipped tender and a removable fly patch. The second is an extra storage space that can hold a small fly box or extra accessories. The main compartment pocket is large enough to fit a sizable fly box. It is designed with a padded, adjustable neck strap and an adjustable back strap. The neck strap includes a D-ring for net attachment and there are also multiple attachment points for extra accessories located around the pack. It also includes heavy-duty molded zippers for extra durability. This is a great beginner pick for a chest pack. It features all the space you could need while remaining fairly lightweight and compact. While all of the materials used in this aren’t the highest quality you can get (some users have taken issue with seam effectiveness), the zippers are very durable and well-made. The William Joseph chest pack is unlike any of the others on the market. It features a unique design with a large front compartment, as well as a pack on the back, making it kind of like a backpack/vest. It has multiple layers of pockets to store various amounts of gear and also has several attachment points on the outer body for extra accessories. One of the most unusual parts of this pack is its lack of zippers. Instead, it has Zip-No closure system where the traditional zipper is replaced with a strong magnet. The front pack has a pull-down compartment which can be used as a workstation with a molded foam fly port. This company uses something called “William Joseph Air Track Suspension”, designed to keep the pack breathable and cool throughout the day. Additional features include a tippet control system, built-in retractors, and fully adjustable suspension. Another great chest pack with a more unique design, the pack from William Joseph has several qualities that make it an attractive buy. Although it is a little unusual, the no-zip design does provide easier access to the gear you need, as you can use one hand rather than two. Some users complain about the front-end bulk and the lack of water resistance, but overall this is another solid choice for anyone looking for a great storage system. With the number of fly fishing chest packs on the market, a decision can be really hard to make. When it comes to your purchase, make sure you consider your own gear storage needs, your typical angling style, and your comfort preferences. Hopefully, you’ve found some inspiration from the packs on our list. Happy fishing! Best Fly Rods for Bass – Tailormade Top Picks!